High Twelve Lodge 82 F. & A.M. Welcome to the Official Website of High Twelve Lodge 82, under the Jurisdiction of the Most Worshipful Grand Lodge of Free and Accepted Masons of the Philippines, this website started under the term of our Worshipful Master Romualdo Cunanan. Masonry existed in England long before the creation of the first Grand Lodge, so was Philippine Masonry already alive even before the formation of the Grand Lodge of the Philippine Islands. In 1856, for example, Primera Luz Filipina, the first Masonic lodge in the Philippines, was formed by Jose Malcampo y Monge, a navy ensign who subsequently became Governor General of the Philippines. Primera Luz was chartered by Gran Oriente Luisitano and admitted only Spaniards in its fold. Subsequently, three other lodges were established one after the other: the first by the Germans, the second by the British consul in Nagtahan, and the third by the Spaniards in Pandacan. 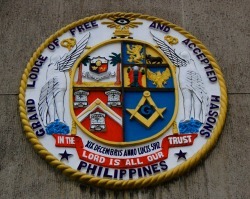 On December 19, 1912, three lodges namely (Manila 342, Cavite 350, and Corregidor 386) that were chartered under the Constitution of the Grand Lodge of California which later changed to Manila 1, Cavite 2 and Corregidor 3) finally succeeded in establishing the Grand Lodge of Free and Accepted Masons of the Philippine Islands, the forerunner of what is now officially known as the Most Worshipful Grand Lodge of Free and Accepted Masons of the Philippines. Not only that, Dr, Serafin Quiazon, head of the National Historical Institute of the Republic of the Philippines, while researching in London on the British trade with the Philippines, stumbled upon a significant piece of historical data. Guissippe Garibaldi, that brilliant Italian revolutionary whom President Abraham Lincoln offered a command in the United States Army during the American Civil War, captained a vessel that anchored in Manila Bay sometime in the middle of the nineteenth century. There is little doubt that the tenets of the Craft landed with Garibaldi in the sandy beaches of the Philippine Islands during that period.